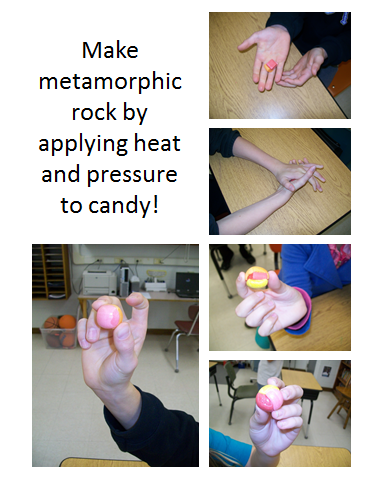 More Earth Science – Metamorphic and Sedimentary Rock! When learning about metamorphic rock, I came across this idea from Adventures of Ms. Smith. She used Starbursts to make rock. We tried, and it worked perfectly! There were a bunch of edible ideas for sedimentary rock, but I didn’t want to get my kiddos too sugared up! (After all, these experiments were on a day where we have no specials – so they never left the room!) Instead I pulled out the trusty play dough and brought in some rock from the playground. Tada – sedimentary rock layers turned into rock! Looking for more science ideas? I have a Pinterest board devoted to science, and another one specifically for 6th grade science. There you have it! A few more random science ideas!